PALM BEACH GARDENS, Fla. - The Democratic candidates for Florida governor fought over who would best stand up to President Donald Trump during a debate Thursday, an infrequent break from an hour where they often repeated talking points they've used throughout the campaign. Former Miami Beach Mayor Philip Levine and businessman Chris King attacked billionaire developer Jeff Greene, a member of Trump's Mar-a-Lago club, for saying the day after the 2016 election that Trump was a "great guy." Greene countered by saying Hillary Clinton and other Democrats made similar pleas for national unity, but now that Trump has been in office and is harming the country, that no longer applies. All five candidates went after the National Rifle Association during the hour-long televised debate sponsored by the Florida Press Association, saying it has established a stranglehold on Florida government during 20 years under Republican rule of the governorship and Legislature. Former U.S. Rep. Gwen Graham said she would welcome the NRA's opposition, while Tallahassee Mayor Andrew Gillum said he led his city when it was sued by gun rights groups for refusing to repeal a no-longer enforced ordinance banning shooting in public parks. Greene has billed himself as the anti-Trump candidate, running commercials featuring video of an argument he had with the president over Greene's support of Hillary Clinton in 2016. "I am the only one who has stood up against President Trump," Greene said. "I was on CNBC, and I said exactly what I felt, that I would be scared to death to have Donald Trump as president. And let me tell you, it couldn't be worse." That led to King and Levine to launch the most direct attacks of the night, going after Greene's post-election comments about Trump. "Greene says he is Donald Trump's worst nightmare but after Donald Trump was elected 20 months ago, he called him a great guy who he was behind 100 percent," King said. "Now it is OK to support the president, but we have to stand up to a guy we all obviously have a lot of problems with." Levine said Trump's conduct before the election should have precluded Greene for calling him a "great guy" after he won. "He really mocked disabled people. He insulted every woman in America, and matter of fact, he did worse than that, he told John McCain he wasn't a war hero," Levine said. "It sounds like you (Greene) are like Donald Trump and one Donald Trump is enough." Graham said that "as a mom, I am appalled with what this president represents. We can never normalize it. We can never make it OK...I have called Donald Trump an embarrassment." Gillum said he is the only candidate who has called for Trump's impeachment because of his conduct during the ongoing Russian election interference investigation. "It is very clear that he obstructed justice," Gillum said. "The fact is, there is the rule of law and this president broke it." 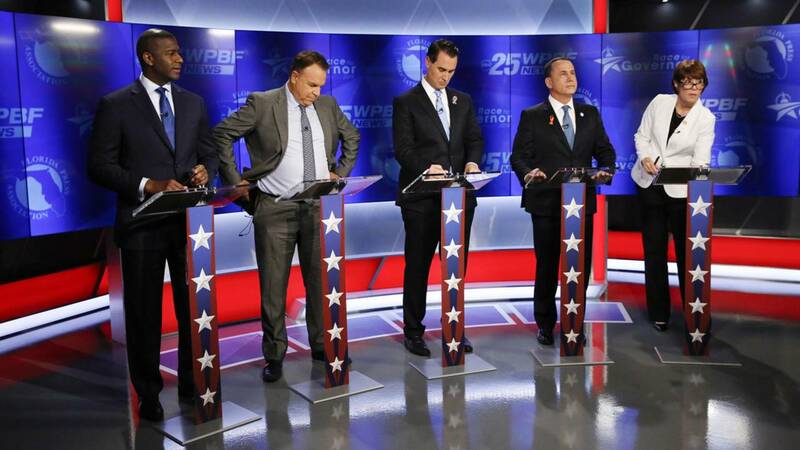 All five candidates vowed to repeal Florida's contentious "stand your ground" law, which allows people to use deadly force if they believe they are in imminent danger of death or great bodily harm. Some also attacked Marion Hammer, the NRA's Florida lobbyist and one of the state's powerbrokers, by name. "It simply said you cannot shoot guns in parks where our children play and our families picnic. They said that was too radical," Gillum said. "We need to untangle the power hold the NRA has." Graham said she will sign an executive order banning the sale of assault weapons, even though she knows it will be challenged in court by the NRA - "Bring it on." Greene said, "I think what they (the NRA) have done to our communities is repulsive, making our schools unsafe." Levine said the state needs to have an Education Security Administration. "People ask, 'Can we afford it? ... My answer to that is we can't afford not to."